A few weeks back we wrote that the deck-building word game Paperback ($3.99) was getting a digital version, and that version would be coming out soon. Well, “soon" has arrived since Paperback has just released on the App Store. In the game you play an author trying to finish genre novels like Sci-Fi, Romance, Westerns, and so on. 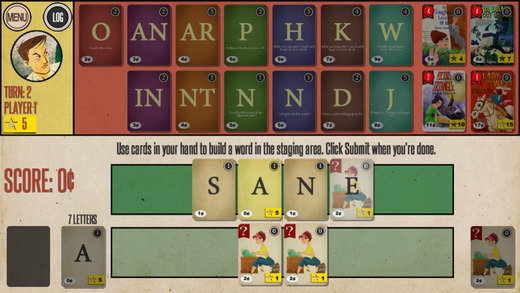 You start with a deck of letter cards, and as you form words, you earn money that you then use to purchase even more powerful letters (in a way like you do what you do in games like Ascension minus the word-building). Many of the letters have special abilities that get activated when used in a word. The game features 3 levels of AI opponents as well as hotseat play with up to 4 players. Unfortunately, there’s no online multiplayer, but apparently it will be added soon in a future update. The game is a premium app and looks like great fun, especially for those who love books.